Major retailers, which include Walmart and Kroger, have been replacing their OPS dessert containers with APET alternatives. The reason? The APET containers are superior to their OPS counterparts in just about every sense except price. There is good news on that front, however. For a long time, the price difference between these APET and OPS containers was quite large, but these large retailers have used their purchasing power to drive the price down and significantly reduce the pricing gap. Essentially, we have these big players to thank for making this superior product more affordable to smaller businesses. Clarity is key to maximizing the eye-appeal of your desserts and display cases. This eye-appeal is essential to your impulse buying and, thereby, your sales. OPS has always been used for dessert packaging because it is known for its high clarity. APET containers are even clearer. If you currently use OPS containers, you will not sacrifice the clarity of your containers if you make the switch; you will enhance it. These APET containers are significantly stronger and, therefore, more durable than the OPS containers. This superior strength allows retailers to confidently stack the containers in their display cases. If you are skeptical that the APET is that much stronger than the OPS, try crushing both types of containers but be careful not to cut yourself with the OPS containers. You will find the results to be remarkable. APET containers are also resistant to impact damage unlike OPS containers. If either type of container was to fall, the pastries would certainly be damaged. The difference is that an OPS container that shatters will leave a large, annoying mess behind as the contents will spill. With APET containers, the contents will not spill and there will, therefore, be no cleanup. This is beneficial to both you and your customers. You will save in labor, as your employees will not have to stop what they are doing and invest their time cleaning up the mess. The benefit is much larger for your customer. A customer will surely get quite annoyed if they happen to drop their pastry and it spills everywhere. You can spare your customers the frustration if you choose to use an APET container. prevents this scenario from occurring. OPS containers crack fairly easily. APET containers are so much stronger than the OPS containers that the APET containers will not crack unlike their OPS equivalents. This is important for four important reasons. First off, this benefit will reduce your total spend. You will save money by not having to replace containers that have cracked. Secondly, your customers and employees will be safer. When OPS cracks, the edges are quite sharp. The edges will likely cut the person using the container because they are that sharp. These cuts reduce both customer satisfaction and employee morale. Thirdly, scratched up containers just do not look very nice in your display cases, and eye-appeal is everything in your line of business. Lastly, if your customer’s container cracks after he or she leaves your store, the air that comes in through that crack will reduce the life of your customer’s product. APET containers can extend your product life in two important ways. APET containers do not crack, which means that air does not have the opportunity to enter the packaging and dry out your pastry. 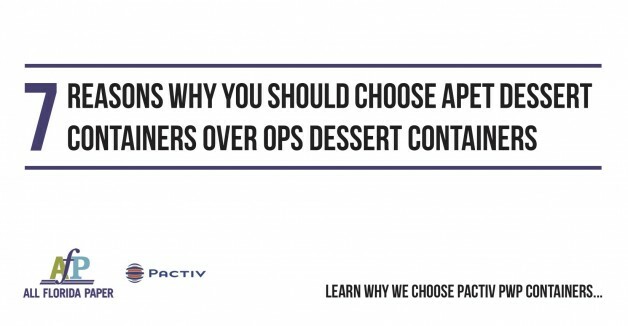 Oftentimes with OPS, the container will crack from opening and closing the container time again like all customers inevitably do with their pastries. Customers will be surprised and grateful to see how much longer their pastries last in the APET containers if you choose to go that route. APET containers are also freezable. Freezable containers extend your product life. The containers can tolerate temperatures between 20°F and 120°F. The containers remain high in clarity even at very cold temperatures. Now you can get into the frozen cake market without a problem. No cracking means no dangerous cuts. This is an important advantage APET containers have over OPS containers. APET is eco-friendly unlike OPS. It is one of the most recycled plastics in the world. Post-consumer recycled APET is actually often used to make APET containers. These containers are also reusable. For these reasons, the plastic that would otherwise go to landfills is repurposed, reducing environmental impact.